If you’ve been following our blog for a while, you’ve probably seen our bucket list to visit all NBA arenas in which we had previously visited 8 arenas. The 8 arenas were the Target Center, Madison Square Garden, the Rose Garden, Staples Center, TD Garden, Phillips Arena, the Amway Center, and the United Center. Today, we got to visit the Verizon Center in DC. 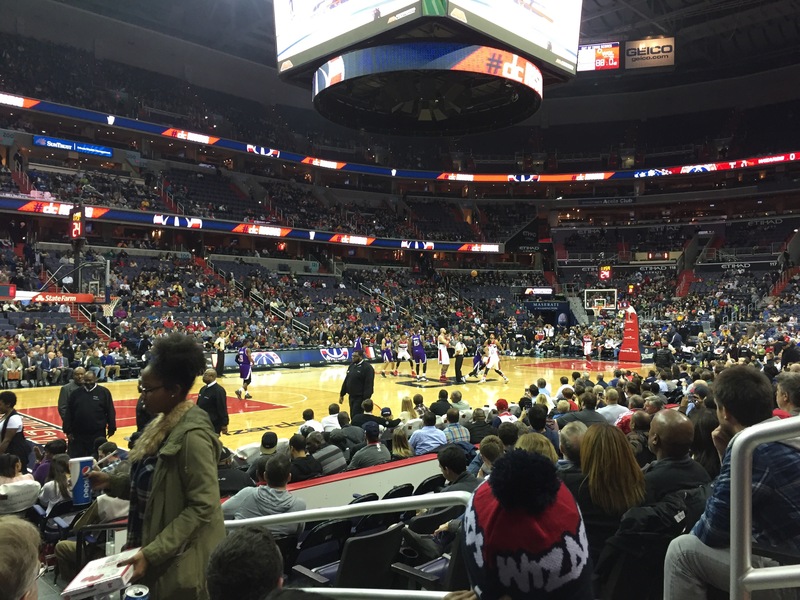 Arena 9: Verizon Center, Wizards vs Kings, 2015, Washington D.C. The venue was definitely lit and exciting. Fans were really engaged and supportive of the Wizards. We sat around a good amount of season ticket holders and they were cheering like the team was still good. They seem quite knowledgable about the game. They were excited to see some DC-products in Rudy Gay and Caron ‘Tuff Juice’ Butler come home and play, both went to UCONN. The chairs in the stadium were roomy and the stadium crew was constantly playing great background music. It also helped that there was a Dunkin Donuts in the stadium as my wife and I were fairly tired heading to the arena. The NBA-wide marketing scheme of giving out something free in the fourth quarter if an opposing team player misses two consecutive free is pure genius. Just admiring it from a business-perspective. Fans definitely go crazy for some free Chic-Fil-A. The Wizards were without Gary Neal and Bradley Beal in this one, so they needed someone to step up. Those guys were Martin Gortat and Garrett Temple. Gortat was huge in the first quarter. Temple provided much needed three-point shooting and defense. Kris Humphries has definitely developed a three-point shot as well. As much as I dislike the former Minnesota Gopher, he has found a way to extend his career in the NBA. The rookie Kelly Oubre Jr filled in well for the struggling Otto Porter. John Wall was definitely impressive posting a career-high 19 assists in the game. Former Timberwolves included: Gary Neal, Ramon Sessions, Ryan Hollins, Kosta Koufos, and head coach Randy Wittman. Did Martell Webster get released after his season ending injury? If not, add him to the list. All reminders of days that should be forgotten. While at this game, the Wolves lost to the Celtics. Kevin Garnett did not play but received a standing ovation from the Boston fandom. Andrew Wiggins seemed to struggle early but had 26 points. The young Dream, Karl-Anthony Towns had a monster line: 25 points, 16 rebounds, & 3 blocks. Reporting live from DC. The Timber Rebuilder.